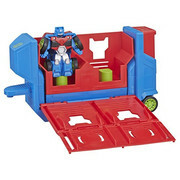 Auf der Toy Fair wurden auch die neusten Transformers Rescue Bots gezeigt. Zu sehen sind: Hot Shot, Whirl und das Academy Rescue Team. 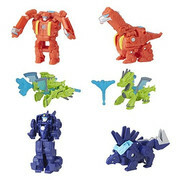 Hier sind die Bilder zu den Transformers Rescue Bots Academy Toys Green Drake, Mega Mighties Hot Shot und Electronic Hot Shot. 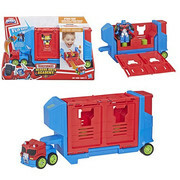 Hier haben wir die Bilder vom Rescue Bots Academy Optimus Prime Launching Trailer. Aus dem Trailer können die Rescue Bots raus rollen. Der Optimus Prime ist ein Retool vom Rescan Optimus Prime. Hier haben wir die Bilder von den Flip Racers Sets. es sind zwei Sets einmal mit Heatwave und das andere Set ist mit Quickshadow. 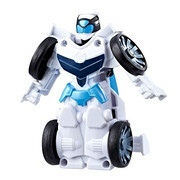 Race to the rescue with the Rescue Bots Flip Racers figures! Sized right for small hands, these Flip Racers vehicles feature pull-back-and-go action! Pull back the Heatwave the Fire-Bot vehicle until the wheels click and then release it to send it racing off! 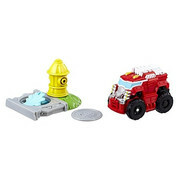 For even more fun, try sending Heatwave the Fire-Bot crashing into the fire hydrant accessory to launch the manhole cover and imagine putting out a fire! Convert from vehicle mode to bot mode in 1 easy step! 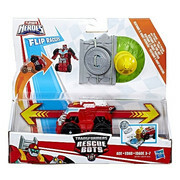 Flip up the Heatwave the Fire-Bot vehicle to convert it to bot mode. Flip it back down to convert it into a firetruck. Robots and humans saving the day, working together the Rescue Bots way! 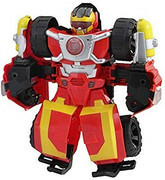 Manufactured under license from TOMY Company, Ltd.
Transformers Rescue Bots is a trademark and copyright of Hasbro. 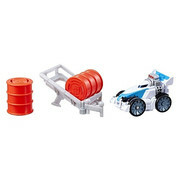 Includes 1 Flip Racers figure, fire hydrant accessory, and manhole cover. Some poses may require additional support. 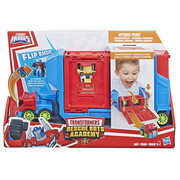 Race to the rescue with the Rescue Bots Flip Racers figures! Sized right for small hands, these Flip Racers vehicles feature pull-back-and-go action! Pull back the Quickshadow figure in vehicle mode until the wheels click and then release it to send it racing off! For even more fun, try sending Quickshadow crashing into the trailer accessory to release the fuel drums and imagine sending them rolling to the scene of a rescue! Convert from vehicle mode to bot mode in 1 easy step! Flip up the Quickshadow vehicle to convert it to bot mode. Flip it back down to convert it into a race car. Robots and humans saving the day, working together the Rescue Bots way! 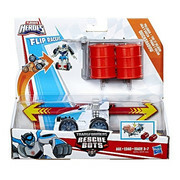 Includes 1 Flip Racers figure, trailer accessory, and 2 fuel drums. Im nächsten Jahr soll die neue Serie Transformers Rescue Bots Academy laufen. Dazu haben wir jetzt das neue Poster. Zu sehen sind Hot Shot, Hoist, Evergreen Optimus Prime, Heatwave, Wedge, Chase, Medix, Whirl und neu dabei ist Evergreen Bumblebee. Jetzt können wir euch die Bilder vom Transformers Rescue Bots Academy Electronic Hot Shot zeigen. Robots and humans saving the day, working together the Rescue Bots way! 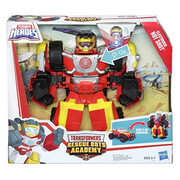 Little heroes can imagine racing to the rescue with this Transformers Rescue Bots Academy Electronic Hot Shot figure featuring Easy 2 Do conversion and electronic lights and sounds! Imagine helping Hot Shot race to the rescue as an off-road vehicle! 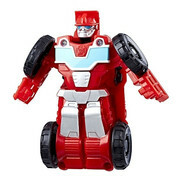 Sized right for small hands, kids can convert the Electronic Hot Shot figure from vehicle mode to bot mode and back again with 1-step Easy 2 Do conversion. Both vehicle and bot modes feature electronic lights, sounds effects, and phrases! Robots and humans saving the day, working together the Rescue Bots way! Little heroes can pretend to race to the rescue with Electronic Hot Shot in vehicle mode as a rugged off-road vehicle, or in bot mode! 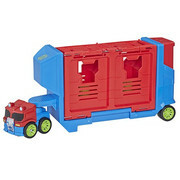 Convert Hot Shot from vehicle mode to bot mode and back again with 1-step Easy 2 Do conversion. Imagine charging to the scene of an emergency while activating fun electronic lights, sounds effects, and phrases with the push of a button in both modes! Selected personally by Optimus Prime, Hot Shot is in training to become a Rescue Bot at the Rescue Bots Academy! Through heroic rescue missions, both simulated and real life, he will learn the importance of teamwork and what it means to be a hero! Hier ist das San Diego Comic Con 2018 Transformers Rescue Bots Toys Display. Hier ist der neue Transformers Rescue Bots Academy Trailer. 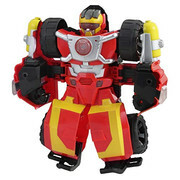 Hier haben wir die Bilder von den Rescue Bots Rescan 2018 Figuren Optimus Prime und Heatwave.